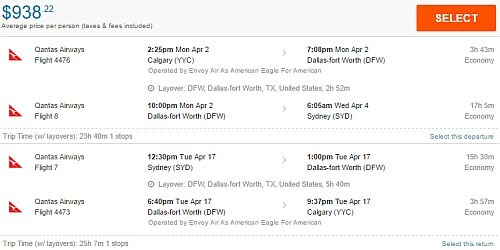 Qantas has dropped the price of their 2018 flights from Calgary to Sydney, Australia down to $938 CAD roundtrip including taxes. Qantas is often ranked in the top 15 of airlines worldwide. These flights have 1 stop each way, in Los Angeles or Dallas. 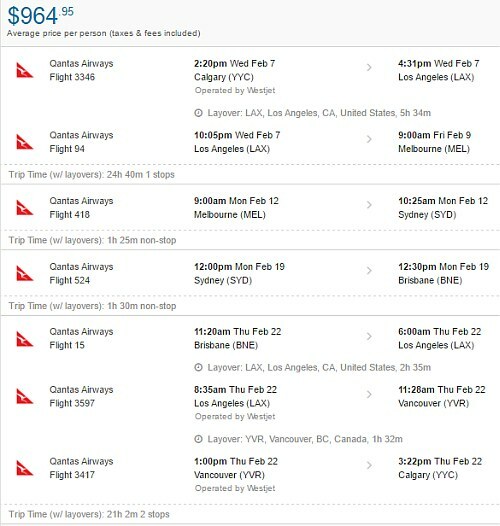 You can also try searching for flights from Calgary to Brisbane (BNE) or Melbourne (MEL), Australia using the same dates and find flights for a similar price. 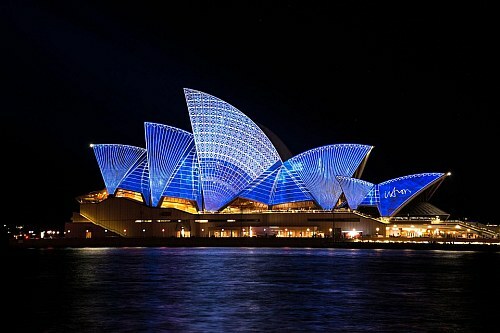 You can also find 3-in-1 trips that allow you to visit all 3 of these major Australian cities (Sydney, Brisbane, Melbourne) on one trip for just $964 CAD ! NOTE: After your search completes on FlightHub.com, you may need to click on '1 Stop' on the left hand side. 4. As for the dates to use, for the first and last legs of the journey, try using the start and end dates from the list of regular roundtrip flight dates in the section above. And then play around with the middle date, to give you more or less time in Australia vs Los Angeles or San Francisco. 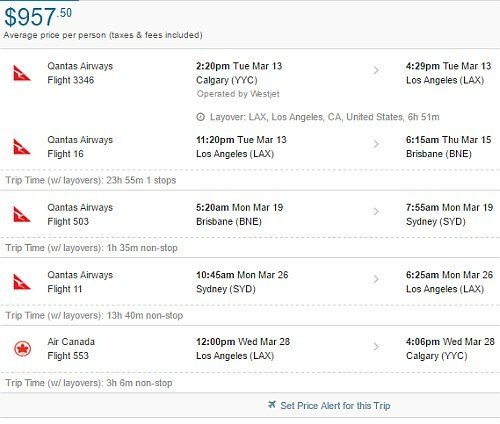 Here's an example with just 1 layover on the way from Calgary to Brisbane, and non-stop flights the rest of the way! You can also find 3-in-1 trips that allow you to visit 3 major Australian cities on one trip (Melbourne, Sydney, and Brisbane) for just $964 CAD ! Once your FlightHub search completes, click on '1-stop only' on the left hand side. 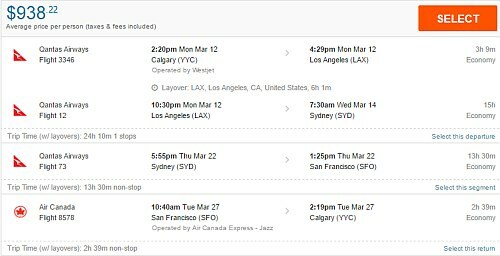 3 Responses to "Calgary to Sydney, Brisbane, or Melbourne, Australia - $938 CAD roundtrip including taxes on Qantas | add Los Angeles or San Francisco for free"
Hey Chris - Our fourth time booking with a YYC deal.. 3500 taxes in to Sydney for a family of four - Over spring break. Thank you. Wow! Thanks Anjli. I'm glad it helped! They are a pretty large booking site, especially in Canada. And generally, the larger the booking site, the easier it is to find bad reviews.